8.0 mil general purpose outdoor grade polyurethane protective tape with acrylic adhesive. Polyurethane Protective Tapes couple an extremely tough and durable thermoplastic elastomer with an acrylic adhesive in a self adhering tape construction that can be quickly and easily applied to form a long lasting protective surface for your product and/or equipment. It combines a number of unique properties that make the product extremely effective at preventing damage caused by abrasion, erosion, minor impact, and fluids. Extremely Tough and Durable, Providing Long Service Life. A Solvent Free Surface Protection Solution; Environmentally Responsible. Tough thermoplastic polyurethane elastomer designed for outdoor applications. Abrasion, erosion, scratch, puncture, and impact resistant. Conformable to most surfaces. Provides excellent surface protection using a technology that contains no VOC's and is fast and easy to apply. 3M™ Polyurethane Protective Tape 8672 is made from a tough abrasion resistant polyurethane elastomer that resists punctures, tearing, abrasion and erosion. It is formulated for resistance to ultraviolet light. Polyurethane Protective Tape 8672 provides a simple, easy method of protecting a surface from corrosion, abrasion and minor impact damage. It can be installed in a minimum amount of time with simple tools. It can be painted or applied over painted surfaces. Polyurethane Protective Tapes 8672 and 8672 GB are constructed with a long-aging, solvent resistant, pressure sensitive acrylic adhesive that is protected with an easy release paper liner. Polyurethane Protective Tape 8672 is a transparent tape with a paper liner on the adhesive side. 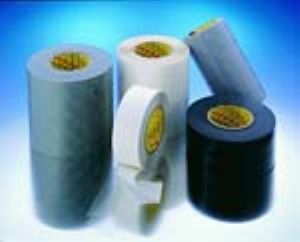 Polyurethane Protective Tape 8672 GB is a glossy black tape with a paper liner on the adhesive side.